Look over this page if you are curious about our work-related experiences. 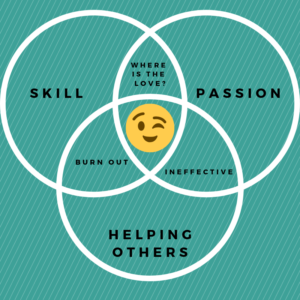 In order to experience career and side hustle fulfillment, we have used a three ring model representing an intersection of intrinsic passions aligned with accurately assessed skills geared at meeting the needs of others. Some of these listed skills will fall by the wayside (like giving guitar lessons), while others will be developed in upcoming years (like writing nonfiction). Adam was able to use his past experience with music to obtain full-time work in campus programming at a local college. The music and art venue he works at comes with a pretty decent schedule. Unlike other work as a musician, it requires very little traveling. He once ran sound at a local open mic for very little pay, but the experience created connections and skills to help him land this gig. Potential Future: Adam could use these skills to produce a podcast and keep recording albums with Michelle. Since he is asked to work as a sound tech for a lot of events in the community, he could expand on this and legitimize it as a business. Home repair and remodeling has been a reoccurring theme in Adam's life. He has completely gutted and remodeled five homes. Pictures and details of minor tasks (painting) and major tasks (blowing out walls and putting up support beams) will be discussed occasionally in this blog. Potential Future: The above skills will be used for remodeling the deck and master bedroom/bathroom at the current house, remodeling a rental and/or flipping another home. Adam spent several years as a carpenter. As a friend, Adam has been focused on empowering single women (like many of Michelle's friends) who have the desire to be homeowners or who are homeowners already. He likes to take the time to teach them how to do simple repairs and tasks themselves (like hanging curtains, solving pest problems, leaky sinks, etc). Potential Future: Expand the above idea into a local business and/or online videos where he walks others through common home repairs/maintenance. A small sample of this experience can be found here. Potential Future: Continue with occasional enjoyable shows and focus on creating online videos for the Savvy History songs. While in Austin, TX Adam worked with Austin Pets Alive as an adoption counselor in order to match potential pet owners with a dog in need of a home. Potential Future: Adam and Michelle would like to help their son start a dog walking business if he is interested. Michelle is a full-time teacher at a school down the street. While teaching the basics of reading to middle school students, she also matches books with students who are facing potential personal or social issues. 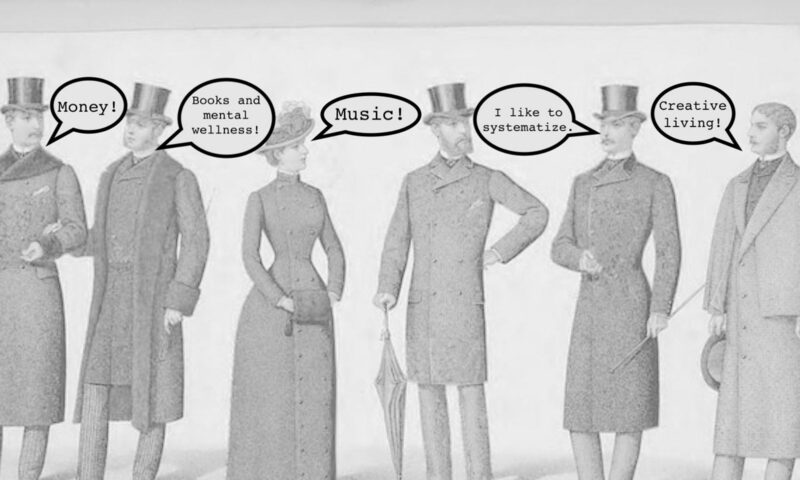 This is a four-step process called bibliotherapy. She studied the process in-depth for her master's thesis. It is used in order to empower others through cathartic release obtained while studying a character's growth and perspective. Potential Future: Michelle is interested in expanding her bibliotherapy service to include book clubs and consulting to people of all ages. The process also aligns with the way she writes music. Michelle has read numerous books on creativity and giftedness, in addition to getting her master's with a focus on gifted education. Potential Future: A lot of individuals in the FI community can easily be identified as gifted systemizers. Michelle has insight into the mental health needs of these individuals and hopes to offer relevant expert content on this blog. In addition, creative artists and musicians are some of the people who could benefit most from information offered by the FI community. The creative class is financially vulnerable by the very nature of their work. It can be said they have the most to gain by obtaining financial freedom in order to unleash their visions with little monetary pressure. With five albums of experience and a vast enjoyment of academics, this is where Michelle hopes to merge a lot of her ideas. Potential Future: Michelle will continue to write songs from the perspective of overlooked people in history. She hopes to do this in themes and batches (like how she narrowed in on inventors for the songs she is recording now). It's also interesting to create songs for historical museums and businesses. In addition, she hopes to blog regularly, freelance, and write a book addressing giftedness, mental health and/or money. With three home remodels under her belt, Michelle has inadvertently come to love the process of turning a shack into a straight-up masterpiece. Potential Future: While remodeling their first few homes, Michelle really loved the role of browsing Craigslist for sinks, showers, doors, windows, stoves, etc. While not the expert in tasks involving physical labor, she will continue to be on the lookout for properties, opportunities, and potential deals while calculating the numbers involved.